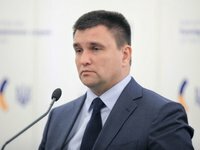 Ukrainian Foreign Minister Pavlo Klimkin has described Russia's sanctions on Ukrainian individuals and legal entities as Moscow's attempt to affect Ukraine in the run-up to elections in the country. "Even an absolutely superficial analysis of Russia's so-called sanctions list and the time of its publication indicates the start of a multi-episode soap opera to try to influence Ukraine in the run-up to the elections and after them. But in fact this is not even the first episode, this is only a teaser," Klimkin wrote on Facebook. Russia's list does not include Klimkin or his deputies.